THE SION HILL masters football unit brought joy to their community when they took hold of the 2018 National Lotteries Authority SVG Over 35s competition, which concluded last Sunday night, at the Victoria Park. Taking on Rock Hard Cement/ Howard Marines Calliaqua in the final, Sion Hill came out 2-1 victors, in what turned out to be a very competitive final. Sion Hill’s goals came from Randy Pierre and Diego Sutherland, with Ishama Mc Kree netting for Calliaqua. It was Sion Hill’s first visit to the final, while for Calliaqua, a former champion, it was their second successive defeat in the final. In 2017, Calliaqua lost out to Computec Vincy Masters in the final. Preceding last Sunday’s final, Layou won the third place, edging out Bequia 1-0, compliments a Greg John first half goal. 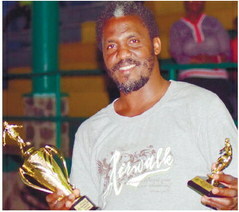 Layou’s Jamal Duncan won the nod as the competition’s best goalkeeper, with Calliaqua’s Lezlo Mc Kenzie, the top goal-scorer, as he netted 13 times. The minor team awards saw dethroned champions Computec Vincy Masters taking the silver plate and Third World Murray’s Village, the bronze place. They were awarded with trophies. Meanwhile, Sion Hill took away the first place trophy, $3,000 and gold medals. Calliaqua earned $2,000, silver medals and a trophy and Layou got $1,000, a trophy and bronze medals.